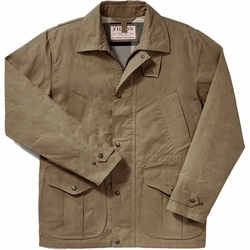 Filson Polson Field Jacket. A lightweight, versatile, all-season field jacket. Outfitted with expandable bellows pockets for shells and accessories. Made with a weather-resistant, 100% cotton shell and lined with 8.5-oz. brushed cotton flannel.